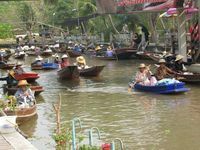 Canoe traffic at the Ta Kha Floating Market. THE wide brim of the lampshade-style hat seems to be devouring the tiny old woman on whose head it sits. Barefoot in her timber canoe, she has been battling other more robust traders for customers in the middle of the narrow canal. She expertly manoeuvres her vessel slowly towards the shade thrown by an undercover picnic area at the side, and is grateful for some respite from the biting sun. Compared with most of the other vessel vendors this morning, she has little to offer as wares - just a few plastic bags filled with plums from her garden. Like any savvy entrepreneur, the crouching woman silently offers up a bunch to show the quality of the produce and to try to persuade our group to buy. But our guide and Thai interpreter, "Lucky", assures us the old woman's plums will be too tart for a Western palate. So, one of our group instead offers her a gift bought earlier: a small jar of sweet rose apples in syrup. At first she is suspicious. Perhaps no stranger has ever shown her such kindness. She holds the jar to the light to investigate its contents, attempts to remove the lid to better smell the strange produce, and finally accepts it graciously - though still a little wary. "Lucky" politely inquires about her age. She proudly tells us she is 86. Her waif-like frame belies the strength she must possess to complete her regular journey of many kilometres and take home the few baht she will receive for her morning's work. Regaining her breath and energy, she takes up her paddle to join the throng of villagers in the middle of the canal once more. 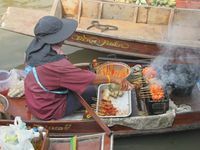 This is the rhythm of life in the real Thailand - a feast for the senses on a stroll beside Ta Kha Floating Market. We have arrived here on a Flavours and Fragrances of the Central Plains tour through Royal Silk holidays - a 350km round trip from Bangkok, covering three days and two nights, discovering the Thai traditions, rich culture and colourful life that reside just behind the cosmopolitan capital. The market is held by the local villagers only on the second, seventh and 12th days of both the waxing and waning moon of the lunar calendar, as well as every Saturday and Sunday from 6am to noon. The main canal is connected to more than 100 klongs, with neighbours anxiously awaiting the arrival of their supplies by waterway, just as we would wait for the postie at Christmas. 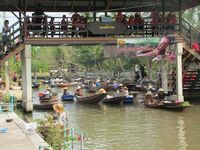 Unlike the more "touristy" floating markets found in other parts of Thailand, this one is much less crowded and more like a farmers' market. This is the fruit bowl of the Central Plains, with bananas, coconuts, watermelon, rose apple, mangoes, limes, jackfruit, durian and a host of alien tropical fruits from home gardens joining with vegetables, herbs, homemade treats and freshly killed meats cooked before your eyes. At water level, the lively exchanges, mix of colours and constant movement are almost overwhelming. Visitors aren't sure where to look next. The smokiness of sizzling chicken kebabs creates a thin veil over the spectacle of villagers in their rolled-up pants and loose, long-sleeved shirts. 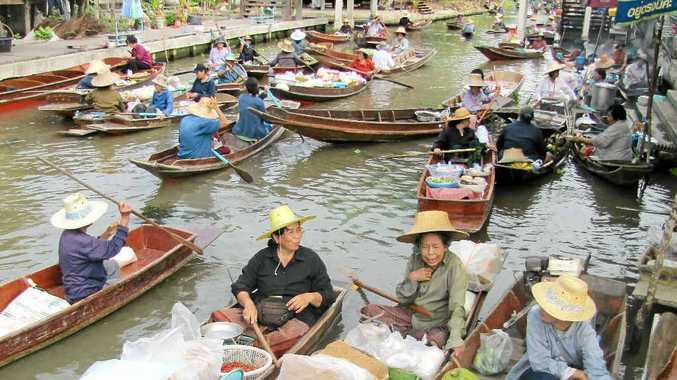 They are seated in individual timber canoes on a narrow khaki-coloured waterway, peddling baskets and colanders filled to the brim with produce. The smell from a basketload of freshly caught fish fillets wafts into our path but doesn't seem to bother the scruffy dogs sleeping on the concrete path. The happy natter of neighbourhood gossip mixes with the serious business of merchants and customers negotiating a fair price. The occasional log jam of well-used canoes is inevitable in the ordered chaos. But these are alleviated easily by a slight touch of a hand to the offending craft and a gentle push asunder. Although most exchanges seem to be carried out between the boats of neighbours, steps to water level and a rickety footbridge of planks across the canal allow pedestrians to negotiate sales, leaving with armloads of plastic bags containing their weekly shopping. Even white-robed Buddhist monks and the big international hotel chefs come here for super foods that are super fresh and super cheap. The traders' smiling faces are genuinely glad to see our group, even after it becomes obvious we are not big spenders. And here, tourists pay the local set prices. "Some sticky rice, M'am? 5baht." "Want to try some deep-fried banana? 10baht." "You buy rose apple in grilled banana leaves? You tell me how many you like?" "Lucky" points out that these are very good prices. The 10baht bunch of bananas she buys for our morning tea would be 25baht in Bangkok. Visitors quickly get the feeling that life has changed little in this self-sufficient community for hundreds of years. 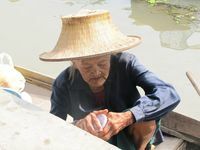 While bartering may have given way to baht and the way of doing things may have been aided by slightly more efficient utensils and more modern, new-fangled devices, the techniques, practices and recipes remain the same. Each market day, as they have done all their lives, the neighbourhood comes together for their weekly gossip session with its bursts of laughter and colourful language - just like any tuckshop day, coffee shop get-together with the girls, or Saturday afternoon down the pub back home. And as I stand on the bridge above the klong, drinking in the spectacle and watching the tiny old woman glide slowly away, I am definitely sold on the simple pleasures of Thai village life.